Globally the prospects for WiMAX may have dimmed somewhat in the past couple of years, partly as a result of the strong growth of HSPA, which is often seen as a rival to WiMAX, and partly as a result of a lost appetite for network spending. But Africa still offers WiMAX technology a home. The very low rate of wireline broadband availability combined with the growing demand for data services, means that wireless technologies will make up the considerable shortfall on the continent. HSPA will be Africa’s biggest wireless broadband technology in terms of subscription numbers, largely because of the extensive network coverage of GSM operators across the continent, as well as the increasing affordability and convenience of HSPA services. But WiMAX can provide a substantial niche as an alternative to wireline broadband for the residential and enterprise markets in Africa. A number of Africa’s larger operators, along with some new entrants, are acquiring WiMAX operators and licenses so that they can focus on those markets. A new WiMAX network is invariably cheaper than a new wireline network, and GSM operators can take advantage of their existing infrastructure when deploying WiMAX. As a result, the number of WiMAX subscriptions in Africa will rise from just 195,000 at end-2009 to 2.5 million at end-2014, according to forecasts by Informa. 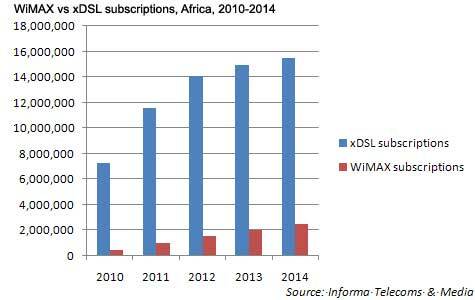 Placed against the number of xDSL subscriptions in Africa, this is obviously a far smaller number, but its growth pattern holds up well. Both France Telecom and MTN use WiMAX in a number of sub-Saharan African markets to offer broadband and telephony services to homes and businesses. Kenya’s Safaricom has acquired two WiMAX operators in the past couple of years – One Communication and Packet Stream Data Networks – with its aim of transforming itself from a mobile operator in a market that is becoming increasingly competitive into an integrated communications provider able to take advantage of the growing demand for business and residential broadband connectivity. Safaricom also offers HSPA-based mobile broadband services, which suggests that it regards the two systems as complementary, with each addressing distinct markets. 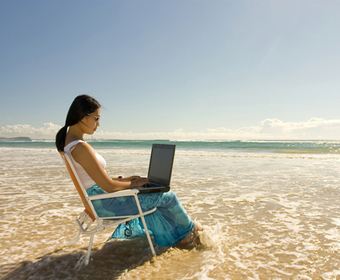 Others that see opportunities in WiMAX include Comium, which operates GSM networks in Cote d’Ivoire, Gambia, Liberia and Sierra Leone, and plans to launch WiMAX services in those countries and five others (Burundi, the Democratic Republic of Congo, Rwanda, Uganda and Zambia) by end-2010. Reliance WiMAX World, a division of Reliance Communications, has acquired WiMAX licenses or licensees in a dozen or more countries in sub-Saharan Africa. And Augere, a company set up by former Orange group executives, has launched WiMAX services in Pakistan and Bangladesh, and plans to do so in Tanzania and Uganda in 2010. The message for African operators, or those seeking to operate in Africa, is that they should consider using WiMAX as perhaps the best means of addressing one of the most important growth markets on the continent – business and residential broadband.